Sharp suiting is all good and well – as is a strong shirt and shoe game – but the accessory which really sets off a suit, almost literally the bow on top, is your tie. The sheer number of possible suit, shirt and tie combinations make setting out a simple and universally-applicable set of rules nigh on impossible. But, there are several guidelines you should be sticking to if you want to tie up every outfit the best you can. y wearing a tie. What’s the point in putting one on if it literally fades into the background? Matching with your suit itself is a little trickier. Again, in general, you should aim for your tie to be around the same tone as your jacket and trousers. But this doesn’t work with lighter suits, where you should go darker. So judge each case individually – but keep colours similar. If you’re wearing a blue suit, go for a navy tie over a green one. If you’re wearing a grey suit, choose a black tie. Your colours should complement, not clash – so even if you choose the wrong tone, get the hue right and you won’t go far wrong. Colours are one thing, patterns another. 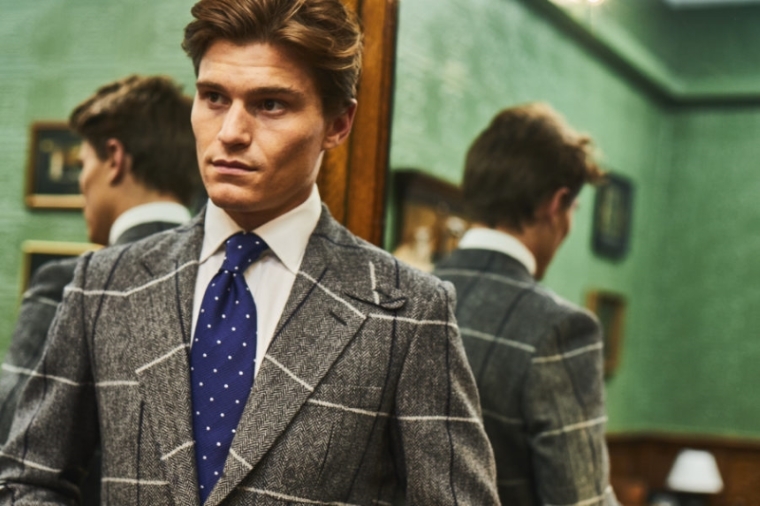 Introducing multiple colours into one tie – in the form of spots, stripes, checks or prints – and you make the whole process of matching your suit with your tie much more difficult. Though this isn’t to say it’s not worth it. Stick to the rule of two. Your shirt and suit could be patterned, as could your shirt and tie. But never wear a shirt, suit and tie that are, all three, patterned, as your outfit will look far too busy. Choose a tight, subtle pattern to play it safe and sophisticated, and ensure that whatever pattern adorns your tie, it doesn’t clash with the pattern of your suit or shirt. Going for stripes? Stick with stripes across the board. A little-thought through process, matching the size of your tie to the style of your suit is another important step. Thankfully, after all the loopholes and exceptions in the colour department, this is rather cut-and-dry. If your suit is slim-fit and tightly-tailored, go for a skinnier tie. If it is bombastic, wide-lapelled or double-breasted, go for something wider, so it doesn’t get lost in the mix. The ‘bigger’ your suit, the ‘bigger’ your tie. Simple. a silk tie. If if’s a summer wedding, and you’ve pulled on your linen duds, go for a cotton or knitted tie. Simply put, the more casual your suit, the more casual your tie. Shiny silk offerings are at the top of the formality scale, and dull linen or wool sit at the other end. Don’t get caught wearing a squared-off knitted tie with your sharpest business suit and, vice-versa, keep your striped silk accessories away from your heavy wool winter suits.